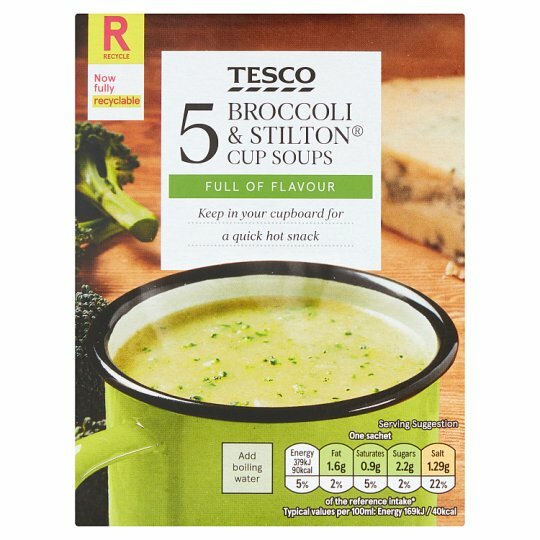 Instant broccoli and Stilton® soup. INGREDIENTS: Maltodextrin, Potato Starch, Dried Glucose Syrup, Whey Powder (Milk), Broccoli Powder (4.5%), Palm Oil, Cheese Powder (4.5%), Flavourings (contain Milk, Barley, Celery), Salt, Potato Powder, Onion Powder, Dried Broccoli, Garlic Powder, Milk Proteins, Colour (Curcumin) (contains Milk), Stabilisers (Dipotassium Phosphate, Trisodium Citrate), Ground Black Pepper. Cheese Powder contains: Blue Stilton® Cheese (Milk), Cheese Powder (Milk), Cheddar Cheese Powder (Milk). Empty contents of one sachet into a large cup or mug. Add 200ml (1/3 pint) of boiling water, stirring continuously until dissolved.